After a gauge issue (argh), we are on our way! One sleeve is complete and hanging out on a spare needle while I work on the body. A few little detail things popped up right away, like the stitch patterns beginning on a wrong side row. I called the preceding right side row "row zero", knit all the stitches along that row, and worked my first buttonhole there, which means subsequent buttonholes happen on row 20 (pretty easy to remember). I also decided to alternate the start point of the Marriage Lines pattern. It zigs one way for ten rows and the other way for the next ten rows. 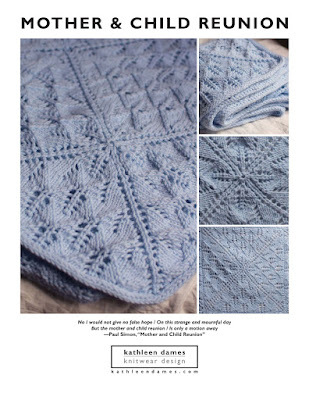 By starting one side on row one and the other side of the Nosegay pattern on row eleven, the patterns frame that show-stopper in the middle. So far I'm really enjoying this design. The elements all work together nicely (Nosegay is ten rows, Marriage Lines twenty, as are the buttonholes, so everything is in synch). 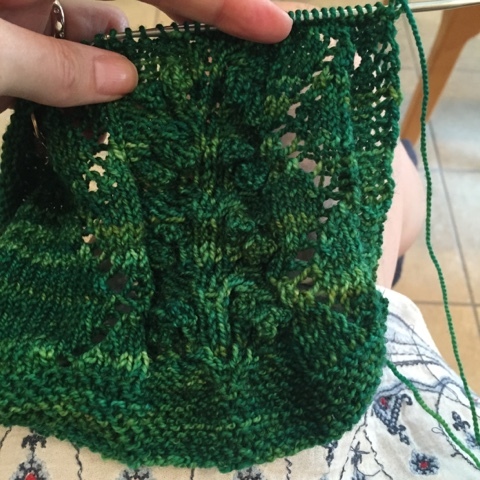 There's plenty of stockinette to speed me along. And the yarn is so pretty (Neighborhood Yarn Studio Sock in Fells Point). Now it's just a matter of racing against the wedding clock. Keep your fingers crossed for me! Next step: Knitting and more knitting. I plan to work the body up to the underarms, then the second sleeve, then join them all together for the best part: the yoke!